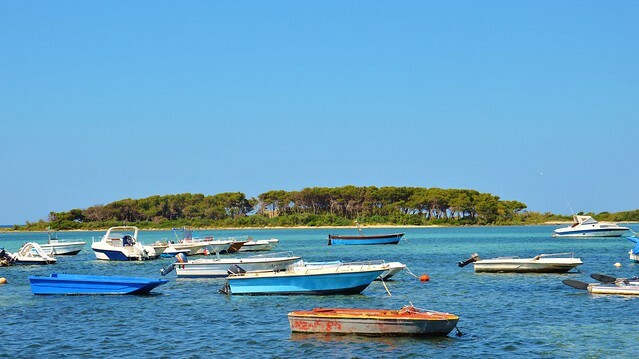 Home » Category: "Lecce Province"
About 1 km from the coastal village of Porto Cesareo there is the charming Rabbits Isle (Isola dei Conigli), a must-see if you’re in the area! The island runs parallel to the coast, it is about 2,5 km long and just over 400m wide. Also known on the sailing maps with the name of Isola Grande, it was renamed Rabbit Island due to a herd of cattle that was started on the island for the local population, particularly rabbits. The stretch of sea that separates the island from the coast reaches a maximum height of 40 feet, which is why a lot of people swim to the island or walk for short excursions or perhaps to spend the entire day. Alternatively, the island can be reached by boat from the nearby harbor and, for a few euros, you can indeed get a ride from the local fishermen who can also come and pick you up at an agreed hour; alternatively you can hire the typical Italian “pedalò”. It is important to note that the island is completely uninhabited and without accommodations, bars or any recreational structures. Essentially it is a true natural oasis. The island is mostly covered by pine trees, Aleppo and Acacias trees, and typical Mediterranean vegetation, which cover most of the dunes and beaches of Salento Peninsula. It is part of the Marine Protected Area of Porto Cesareo and is surrounded by beautiful seabed, perfect for diving lovers! Lu Salentu: lu sule, lu mare, lu ientu (Salento: the sun, the sea, the wind) is definitely the best saying that people use, here in this land in their own dialect, to describe this land. Salento, also known as the Salento peninsula is a sub-region that extends over the southern part of Puglia, and is washed by the wonderful Ionian and Adriatic Seas. The area includes the entire Lecce province, almost whole Brindisi province and part of the Taranto one. Otranto is a town in the province of Lecce and is part the Salento area. It is located in a harbor along the east coast on the Adriatic Sea and is the easternmost town in Italy. Its small seaport is mostly used for fishing activity and tourism, especially for the ferry services to Greece. The city also gave its name to the Strait of Otranto, which separates Italy from Albania. The old town of Otranto has been declared by UNESCO as “Heritage witness to a culture of peace”. Otranto is strategically located along the coast and is therefore always been considered a natural bridge between East and West. Especially during the Roman Empire when the town became one of the most important maritime centers of Italy and the natural point of trade with Greece. Today Otranto is a quiet town and a popular tourist destination. Its historical center has been included in the list of the most beautiful towns in Italy, from “I borghi piu’ belli d’Italia”, and the town attracts each year thousands of tourists especially during summer months. The town still retains its characteristic appearance of the ancient market towns that are washed by the Mediterranean. While walking around the town, the ancient walls and the Aragonese Castle can be admired. The castle is a massive building which is part of the tough defenses of Otranto. It was built in the 15th century on one of Frederick II’s earlier fortresses ruins. It is open to the public and sometimes houses temporary exhibitions. Another masterpiece of Baroque architecture is the Cathedral of S. Maria Assunta, consecrated in 1088, it has a huge rose window. The interior, has columns said to come from a temple of Minerva and a fine mosaic pavement of 1166, it is one of the largest mosaics in the world and depicts the “tree of life” with interesting representations of the months and Old Testament subjects. The Cathedral has a crypt supported by 42 marble columns. It holds the bones of 800 martyrs (later proclaimed saints ) who were killed by the Turks in 1480 in an attempt to conquer the town. Bones are kept on massive shelves inside the cathedral. Despite the different destruction suffered throughout the time, Otranto retains a very well defined old town, with the typical aspect of the southern Italian houses painted in bright colors which make it very picturesque. The old town is still enclosed within its defensive walls; the small streets are full of bars, restaurants and small souvenirs shops. On summer nights Otranto has a lovely holiday scene and usually street artists fill up the city center with their shows. Tourism is in constant expansion thanks to the beautiful beaches and landscape that this town can offer, and the warm hospitality of the locals. Just a couple of miles north of Castro, there is the phenomenal Zinzulusa Grotto, the most famous Karst cave along the Puglian coastline and considered to be one of the most important examples of this geologic phenomenon in Italy. The name comes from the word zinzuli, meaning rags. In fact the extensive collection of stalactites and stalagmites that fill this cave look like rags hanging from the ceiling. The cave was discovered in 1793 but has only been explored and open to the public for about 50 years. During its exploration, many vases and votive axes dating back 5,000 years were discovered. The excavated part is huge but only a small portion is open to the public and it can only be visited on a guided tour. The entrance to the cave faces the sea, the access consists of a long set of purpose-built steps followed by a walk along the cliff side. If there is high tide the steps are covered and the cave becomes inaccessible. The entrance leads to the Corridoio delle Meraviglie (Corridor of Marvels) which preserves the best rock formations. In this area there is also a small lake, called Trabocchetto, of crystalline water mixed with fresh sea infiltration. It also houses a number of endemic species of aquatic life, among these there is a rare species of shrimp, with no eyes. The corridor leads to a crypt area, also called Duomo (Cathedral) where smooth walls soar 25 meters above the floor level, creating a rather enormous room. The Crypt used to be inhabited by bats which had covered the floor with their guano for 5-7 meters. The guano, solid and on which it was possible to walk, was lifted in 1940 by workers who also created the interior walkways, today used for sightseeing. All bats have since left for less crowded areas, leaving the room open for tourists to enjoy. The final section of the cave is called Cocito, it reaches up to 160 meters beyond the entrance, and houses the small enclosed basin on Cocito. Its waters are characterized by a stratification: in the lower part they are warm and brackish, on the surface they are sweet and cold. The Zinzulusa cave gets very busy in summer. During the summer season many fishing boats are also available just outside the cave’s entrance for tours at the water level: experienced guides will guide you along the cliffs overlooking the sea to discover many coves and small caves. Santa Maria di Leuca, often simply called Leuca, is a small village which is situated at the bottom of Puglia, in a stunning bay between Punta Ristola and Punta Meliso (where the 49 meters lighthouse was built in 1866). The presence of several archaeological remains in its caves proves the human presence in this area as early as the Paleolithic age. The village was named Leukos, literally illuminated by the sun, due to its beauty and brightness. Later, as the story goes, San Pietro chose the town as location from where to initiate his evangelical work, and thus added the Virgin’s name and for the Christians the village became the door to Heaven. Well connected to other towns in Salento, it is a very popular and peaceful village, it’s indeed a tourist destination for travelers who decide to spend the holidays at the bottom of Puglia and particularly in Salento area. With the ability to see both sunrise and sunset over the sea it is often referred to as paradise between the two seas as it marks the point where the Adriatic meets the Ionian Sea. By the end of 1800 Leuca became the summer residence of the Pugliese aristocracy, stunning Tuscan-style, Gothic, French, and Renaissance style villas were built which still today adorn the seafront and the landscape of Leuca. Many of these villas were ravaged and robbed during the Second World War, many of them were also despoiled from the metal decorations (needed to produce weapons) and a few were used in order to accommodate refugees. Some were badly damaged and restored after the war when they underwent a change of style. Among the most important we highlight: Villa Daniele, Villa Fuortes, Villa Mellacqua, Villa La Meridiana, Villa Loreta Stefanachi, Villa Episcopo, Villa Colosso, Villa Arditi, Villa De Francesco, Villa Seracca. An impressive flight of steps leads down from the Basilica to the aqueduct inaugurated by Mussolini during the fascist era. It is, in fact, in Santa Maria di Leuca that the monumental aqueduct delivering water to the whole of Southern Italy has its outlet. 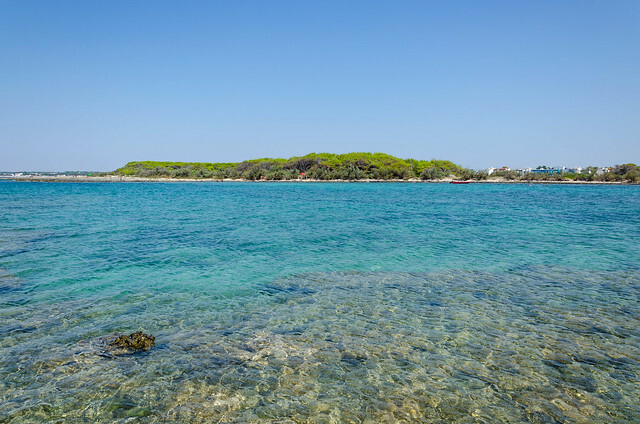 The Regional Natural Park of Porto Selvaggio and Palude del Capitano has been instituted in 2006, it covers 1000 hectares and is located in the Lecce Province along the west coast of Salento between Porto Cesareo and Gallipoli. It includes Porto Selvaggio Park (instituted in 1980) and the Palude del Capitano and is a must-see during any holiday in Salento. Porto Selvaggio (literally Wild Port) is a rocky cove between the two watch towers Torre dell’Alto and Torre Uluzzo. It covers an area of 400 hectares circa and is mainly covered by a dense pine wood, olives, eucalyptus trees and Mediterranean macchia (scrub-land) of acacias and brooms; it also includes a stretch of rocky and jagged coastline which overlooks the Ionian Sea. To reach the coastline you will need to cross the dense pine forest: a ten-minute walk through a pristine forest floor and you will admire the crystal and always clear waters, rocky seabed (often explored by divers) and reefs that reach up to 40 meters. The whole area is protected against tourist development and has various type of habits which are home to a wide range of wildlife including lizards, weasels, finches, foxes and birds like hoopoe, thrush and kestrels. Along the coast there are numerous inlets and caves both underwater and emerged such as Grotta di Torre dell’Alto, Grotta di Uluzzo, Grotta Capelvenere and Grotta del Cavallo. Mainly know for its natual and unspoiled environment, the park of Porto Selvaggio has also a huge importance from cultural and historic point of view and shows many areas of archaeological and pale-ontological interest. The park is in fact dominated by the three towers: Torre dell’Alto, Torre Uluzzo and Torre Inserraglio, built between the XV and XVI for defensive purposes. The Uluzzo Bay also takes us far back in time: in the Grotta del Cavallo (Horse Cave) numerous remains of animals (including rhinos) and artifacts have been found which date back to the Neanderthal Man and the Paleolithic period. The Palude del Capitano, located north of Porto Selvaggio, is an area of marshland and low cliff that lies just a few meters from the coast. This area is mainly covered by the “Spunnulate” (literally sunk): caves that have lost their roof and are filled with water sourced from natural underground springs which communicate with each other and connect the marsh to the open sea. The area is much visited by lovers of bird watching who can admire different species of birds including the moorhen, egret, kestrel, the heron, the hoopoe. Lecce may be called the Florence of the Baroque. In this artistic tendency in Italy there is nothing that can be compared. This is how that the historian Gregorovius described Lecce. Lecce is the capital of the Lecce province and of the Salento sub-region. Located just 11 Km far from the Adriatic Sea and 23Km from the Ionian Sea, it lies in the middle of fertile plain, surrounded by attractive countryside, seashore and small towns. The city can easily be reached from Brindisi airport and it makes the perfect destination for a weekend break or a holiday as it’s a great base for exploring the Salento Peninsula. Lecce is the Baroque masterpiece of Italy and stupefies tourists with its little-known magnificence, its noble palaces and undeniable beauty of its numerous churches. In 2010 the city has been listed in “Best in Travel 2010” by Lonely Planet. Lecce’s history goes back a long way, it was founded by Messapians and then conquered by Romans during the 3rd century BC, at that time it was named Lupiae. Over the centuries, the city has been conquered by many civilizations – the Norman, the Byzantine, the Spanish and other dynasties had settled here and have left a lot of traces of their existence through art and architecture. Its long and noble history is certainly witnessed by the numerous buildings and Churches scattered across its lovely historic centre. The town’s great artistic treasure is its architecture with picturesque little lanes and Baroque churches with facades finely decorated. The 17th century was definitely the period of prosperity which led to grand developments and the construction of palaces and churches. These buildings adapted the fashionable Baroque style to the soft local stone, with decorations and cherubs extravagantly covering facades and doorways. This local style is known as barocco Leccese (‘Lecce Baroque’). Lecce is built of stone that glints gold and cream in the sunlight, it is taken from the surrounding land and it is called pietra leccese (literally stone from Lecce), a light yellow, soft, compact and easily workable limestone. More than the architects, it was the local craftsmen and masons who left their mark in this city, working the stone and letting their ideas run wild especially when designing the facades and creating marvellous compositions made up of animals, birds, monsters, cherubs, flowers and fruit. We start our tour from St. Oronzo square (piazza Sant’Oronozo). This is the central square and big heart of the city, surrounded by shops and cafes it is constantly full of people; it is site of the most important Roman ruins: a 25,000-seat theatre and amphitheater from the 1st century BC, this is where many wild fights between gladiators and beasts had taken place. A big column stands atop the square and a statue of bishop and patron saint Oronzo is perched on top of it. It is one of the two columns which marked the end of ancient Appia road and originally stood in Brindisi. Piazza Duomo (Duomo Square), one of the most beautiful squares in Italy is definitely the best example of Baroque architecture: it is a big enclosed square with the Cathedral sitting on the left corner alongside the 50m high campanile (bell tower). The double-facade Cathedral was built in 1659 with a Latin cross shape and has 13 altars. The main facade is characterized by very simple architecture while the side facade has an exuberant baroque style. Completing the square is the Episcopio (Bishop’s Palace) which is the Bishop’s residence and is built just beside the Cathedral and the Seminario (Seminary). It is adorned with friezes and tall pillars and the courtyard has a beautiful well with two angelic guardians, it is decorated with garlands and also bunches of fruits and flowers. One of the most fascinating expressions of baroque architecture is the Church of Santa Croce, (which lies north of St. Oronzo square) whose baroque façade is as exuberant as its large Renaissance interior is austere. It took a team of craftsmen over 100 years to complete the church but the result is astonishing. Entirely built which leccese stone the facade is a masterpiece of ancient architecture to marvel at, it is ornamented with strange beasts and allegories, cherubs, fantastical monsters, plants. The interior, in stark contrast to the facade, it is done in plain Renaissance style. Other main sights in the city are: Church of St. Nicolò and Cataldo built in 1180, Church of St. Irene dedicated to one of the three patron saints (Oronzo, Domenico and Irene), Church of St. Chiara with a madly decorated altar. Porta Rudiae the ancient entrance to the city before leaving this honour to Porta Napoli also called Triumphal Arch, consisting of two slender Corinthian pairs of columns it is one of the most popular landmarks in town. The castle which was built around an ancient Norman fortification, it consists of two concentric trapezoidal structures surrounded by solid battlements and an impenetrable moat. The Sigismondo Castromediano Province Museum is the oldest in Puglia and as it has been the only museum for years it has an impressive archaeological collection coming from any town in the region. This gives a deep insight to the different ages and civilization the region has gone through. But Lecce is not only Churches, museums and Baroque buildings. Lecce’s old city centre is a big outdoor museum: there’s a grace and original elegance in its wonderful small streets, alleys and courtyards packed with upmarket boutiques, antique shops and furniture restorers. There will be always something capturing your glance: a delicate wrought-iron balustrade, a curving whitewashed arch or simply a soft amber street lamp. Lecce is also famous for the craftspeople who construct various models out of cartapesta (papier màché), there are plenty of small studios in the old town where these artists can be admired while modelling a wire and covering it with paper dipped in glue. Finally the model is painted with oil paints. Not to be missed is also the pietra leccese tradition with many studios in town where artists work and model the famous stone creating great sculptures. Gallipoli is a wonderful town in the province of Lecce and is undoubtedly a must-see in the Salento area. Its name derives from the original Greek name ‘Kalé polis’ meaning ‘beautiful city’. Located along the Ionian coast, the town is divided into two parts: the new and also bigger part is of recent construction and is where the main public buildings and businesses are located. The old part of the town is on a small walled island connected to the mainland by a 6th century bridge. Aside of the bridge there is the Aragonese Castle, it was built in the 13th century and is one of the few castles washed by the sea. Gallipoli is a great town for exploration, lose yourself wandering its winding, picturesque streets. The little old town is surrounded by powerful walls constructed with the aim to defend the city against enemies. Mostly built of white stone, the small historic center is a collection of small streets that blend to form a maze, where you can find beautiful baroque buildings including the Cathedral of Sant’Agata, built in 1629, it is a wonderful example of the Lecce baroque style developed in this region. Of particular historical interest is also the Greek fountain (rebuilt in 1560) being the oldest fountain in Italy. Wandering in the small streets of the old town you will find small shops and businesses where local food and wine can be purchased along with souvenirs. The historic center also houses the fish market, just underneath the bridge, small but very nice and characteristic. 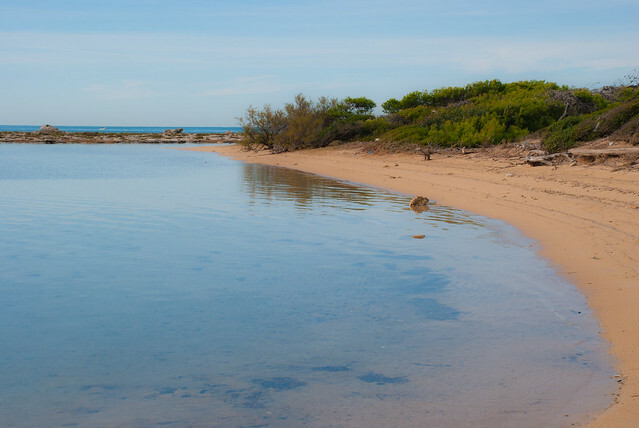 Gallipoli is indeed famous for its fishing port and is a must-visit for seafood lovers. Thanks to its numerous white, sandy beaches and crystal-clear water, Gallipoli is one of the most sought tourist destinations of South Italy. Most of the beautiful beaches are outside the city center, however the “Seno della Purità” meaning the “Breast of Purity”, is within the town walls. It’s a small, pleasant beach where you can take a swim during your visit. After your swimming, climb up the town walls and sit outdoors to eat a seafood dinner at one of the restaurants overlooking this harbor as night falls, certainly the perfect ending to an enjoyable day in Gallipoli. Fun is always guaranteed in Gallipoli, the day can be enjoyed on the beach, along with activities such as spas, natural reserves and water sports. At night the city offers also an amazing nightlife. Many discos and nightclubs are within the city or just outside. The evening usually starts as early as in the late afternoon on the beach where you can enjoy the aperitivo and drink a cocktail on the beach listening to music. Galatina is a city in the Lecce Province and one of the largest in the Salento sub-region; it is located 20 km south of Lecce and 20 km from the Adriatic coast. Mainly an agricultural center it is well-known for wine-production and tobacco-processing. It has very ancient and unclear origins: it probably existed during the Roman times but the first evidences of its existence date back to the Middle Ages when it was a Byzantine and Greek colony. It was originally called San Pietro in Galatina, in honor of the Saint who passed from here on his way to Rome and it kept this name until the unification of Italy in 1861. Like most of the cities in Salento, Galatina has many remnants of the former Greek colonization, even if it reached its cultural peak during the Renaissance and Baroque times when beautiful palaces and churches were built. Among the most important buildings there is the Palace Vernaleone, palace Galluccio-Mezio and palace Gorgoni. In St. Peter’s Square is where the large parish church is located, dedicated to Saints Peter and Paul it was built by architect Zimbalo between 1633 and 1663 in Baroque style and preserves precious paintings in the interior. Galatina is home to the precious Church of Saint Catherine of Alexandria, one of the most beautiful in Salento it was built in Romanesque style. Built in local stone the imposing facade has a coat of arms of the Orsini del Balzo family who ordered its construction in 1384, the church was completed in 1391. The facade is adorned with a statue of Christ and the 12 Apostles. The church is enriched by the graves of the family and an array of columns, but what makes the church famous is the interior: its interior is in fact entirely covered with frescoes and paintings depicting the history of the Virgin, of Saint Catherine, scenes of apocalypse, the Old and New Testament. Finally, the Civic Museum Cavoti which preserves numerous works of asr and paintings of local painters, including Pietro Cavoti and Gaetano Martinez, and works of art from medieval times. It is also one the main centres in the whole Salento for the ritual of tarantella, the folk dance which evolved from the tarantismo. Every year it is celebrated on the 29th of June with a big festival dedicated the Saint Peter and Paul. Its origin is actually bizarre, the tarantati (people who were victims of the tarantula bite) used to go to Galatina to dance all together and the next day they used to go in the church to be blessed and healed by the two Saints. Acaya is a small village, with less than one thousand inhabitants, in the province of Lecce. It is located in the heart of the Salento sub-region, just 5 Km from the WWF oasis of Le Cesine on the Adriatic coast and 20 minutes driving from Lecce, the capital of the province. It has an immense historical and architectural importance as it is one of the few fortified villages left in Italy.Originally named Borgata di Segine (township of Segine), at the end of the 13th century it was given by Charles II d’Angiò to the Acaya family which had arrived in Puglia from Greece. The family ruled the village for over three centuries. During the following two centuries the whole region of Puglia was repeatedly attacked by the Turks and in 1535 the Emperor Charles V decided to fortify the village by giving the project to the magister Gian Giacomo of Acaya, a “royal military engineer”. It was also in that occasion that it was renamed Acaya. Gian Giacomo rebuilt the village following his utopian model of the “ideal town” and providing the village with a solid defensive structure: he continued his father’s work, by building the perfectly rectangular city walls that still surround the village today. He also strengthened three corners by building rampants and bastions into the perimeter walls. The fourth corner was occupied by the castle that his father had built 29 years before. He also added the moat to the castle and a walkaway for guards along the higher part of the surronding defensive walls. Finally he reconstructed the parish church along with the bell tower and built the Convent of Minori Osservanti, dedicated to Saint Antonio. In 1570 Gian Giacomo passed away, Acaya was sold and a period of inevitable decline began. In 1714 Acaya was invaded and destroyed by Turks but the village still retains the original architectural style and is today at the centre of a great restoration and recovering activity which aims to bring the whole area to its the ancient splendour. As part of this restoration, a new 18-hole golf club has been established here in Acaya.